Washington DC, January 23, 2019 – There was no sign of relief on Wednesday for 800,000 federal workers going without pay because of the partial government shutdown as the U.S. Senate scheduled votes on competing proposals facing steep odds to end the month-long impasse triggered by President Trump’s demand for border wall funding. 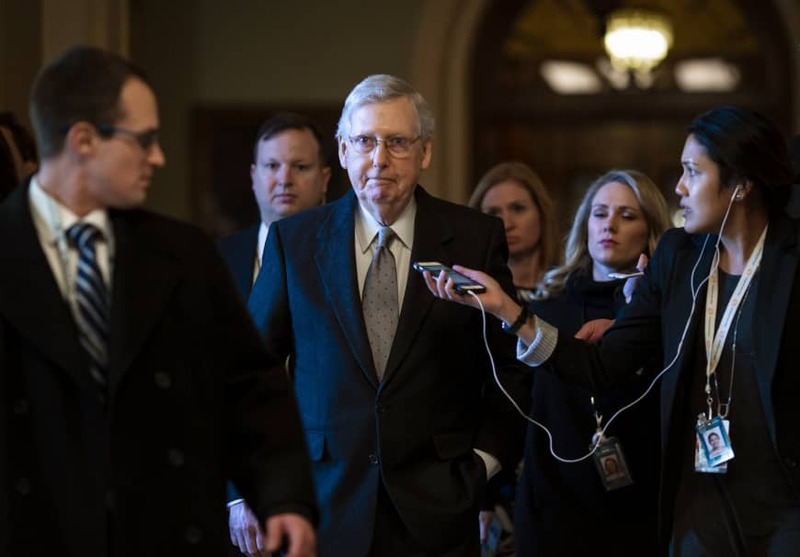 Republican Senate Majority Leader Mitch McConnell said he planned to hold a vote on Thursday on a Democratic proposal that would fund the government for three weeks but does not include the $5.7 billion in U.S.-Mexico border wall funding that Trump wants. Its prospects appeared grim. The House of Representatives has passed several similar bills but Trump has rejected legislation that does not include border wall funding. McConnell previously said he would not consider a bill that Trump did not support. McConnell also planned to hold a vote on legislation that would include border wall funding and temporary relief for “Dreamers,” people brought illegally to the United States as children, a compromise Trump proposed on Saturday. Democrats have dismissed the deal, saying they would not negotiate on border security before reopening the government, and that they would not trade a temporary restoration of the immigrants’ protections from deportation in return for a permanent border wall they view as ineffective. Trump’s plan is “wrapping paper on the same partisan package,” Senate Democratic Leader Chuck Schumer said on Tuesday. Democratic Senator Sherrod Brown on Wednesday said it was up to Congress to resolve the impasse. “President Trump is not going to end this,” he told MSNBC. Republican Senator Mike Rounds said he hopes lawmakers will find some common ground on the legislation. Trump, in a series of morning tweets, pushed fellow Republicans to stand by his promised border wall. He is scheduled to discuss his immigration plan with local leaders in a call on Wednesday morning and with conservative leaders at the White House later in the day. White House spokeswoman Sarah Sanders told reporters on Wednesday that Trump also has made calls to Democrats. The hundreds of thousands of federal workers who are furloughed or working without pay are struggling to make ends meet as the shutdown, the longest in U.S. history, entered its 33rd day. Many have turned to unemployment assistance, food banks and other support, or have sought new jobs.